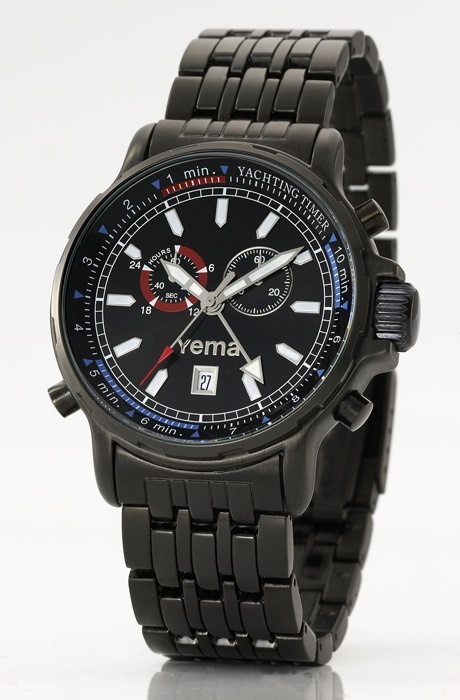 The only French brand in this regatta-yachttimer overview is Yema. 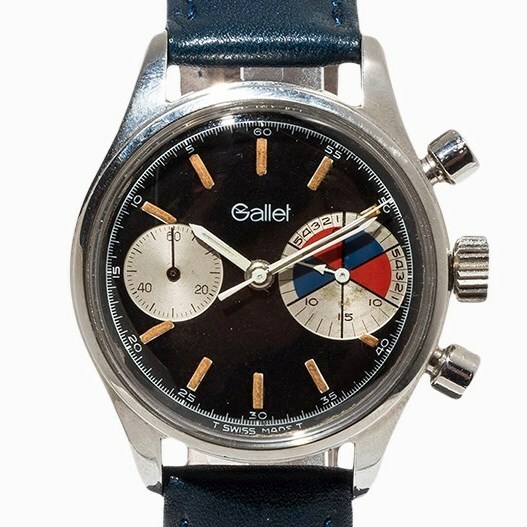 Founded in 1948 in Besançon (Doubs) by Henry Louis Belmont, the company distinguished itself in the very beginning by creating the first automatic chronometers manufactured entirely in France. 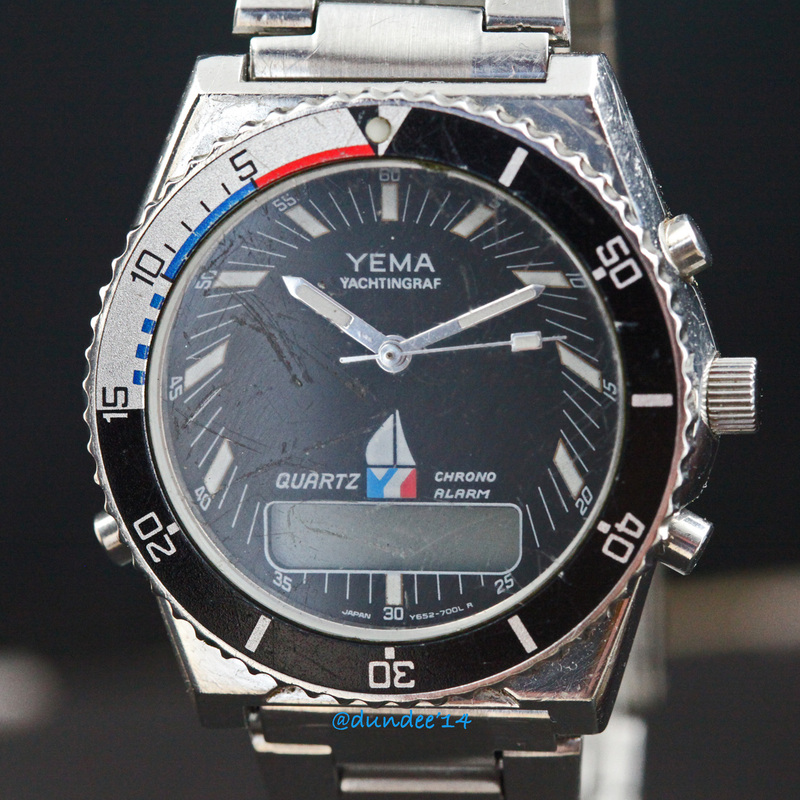 On March 3, 1967 Henry L. Blum of Montres Yema S.A. filed a patent for a ‘Watch for Yachting and Underwater use’. 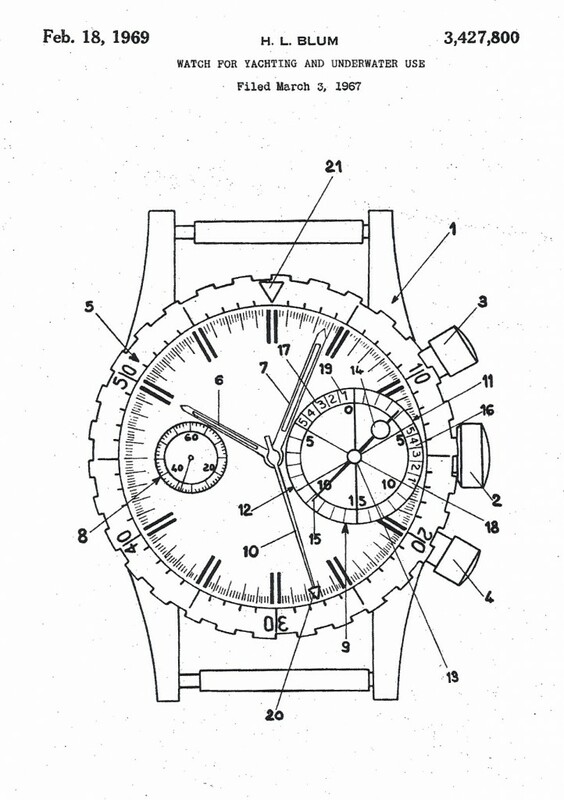 You can download the complete Swiss patent (CH 483.047) as a PDF here, or here if you prefer English (USA 3,427,800). 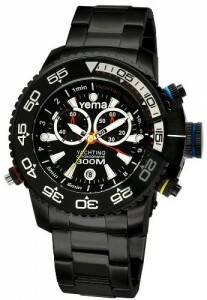 Yema patent US3,427,800 filed by H.L. 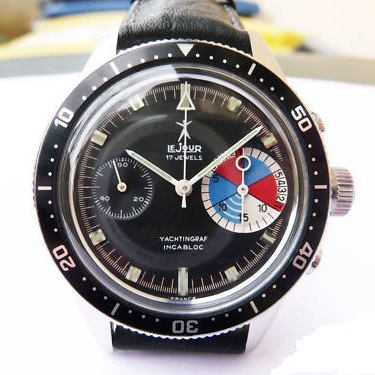 Blum. 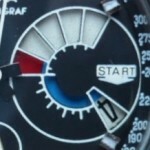 This resulted in the introduction of the Yema Yachtingraf in 1966. 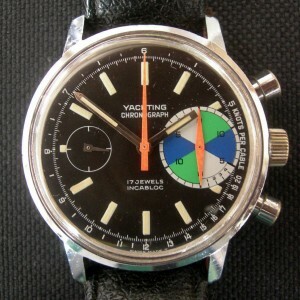 All together 6 different models (7 if you count type 6 in standard or jumbo case as two) of the Yachtingraf were sold between 1966 and 1970. Type 1 (Valjoux 92), type 2 ( Valjoux 7733 or 7734) and type 3 (Valjoux 7734 with date) have a subdial counting the seconds at 9 o’clock, and an oversized 30 minutes subdial at 3 o’clock, divided into 6 differently coloured segments representing 5 minutes each. 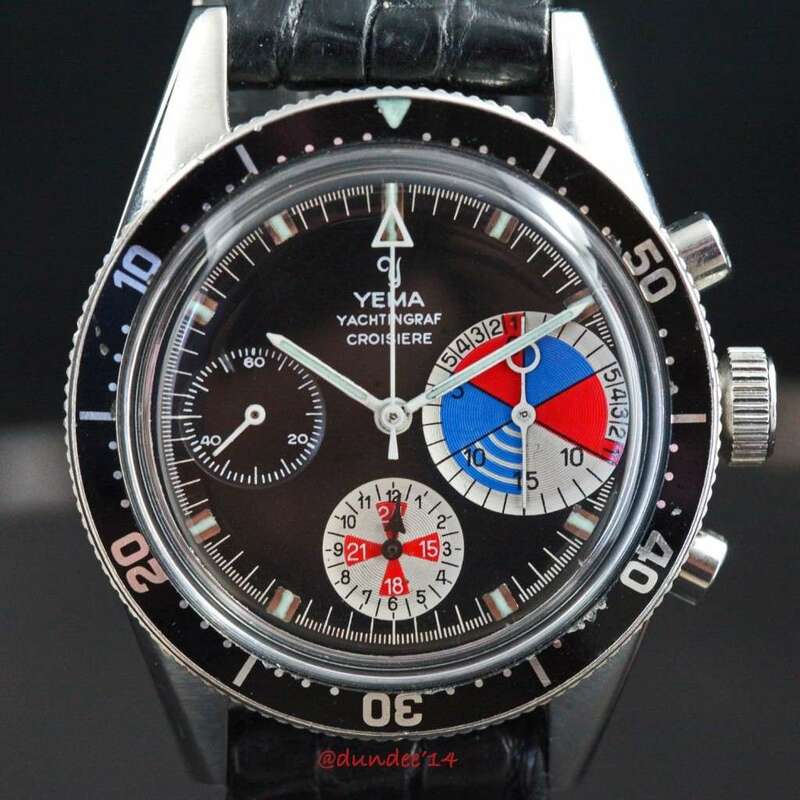 Yema Yachtingraf, 3 versions, 3 different calibers. 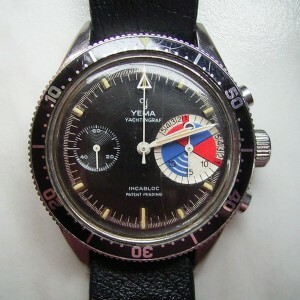 Model: Yema Yachtingraf – type 1. 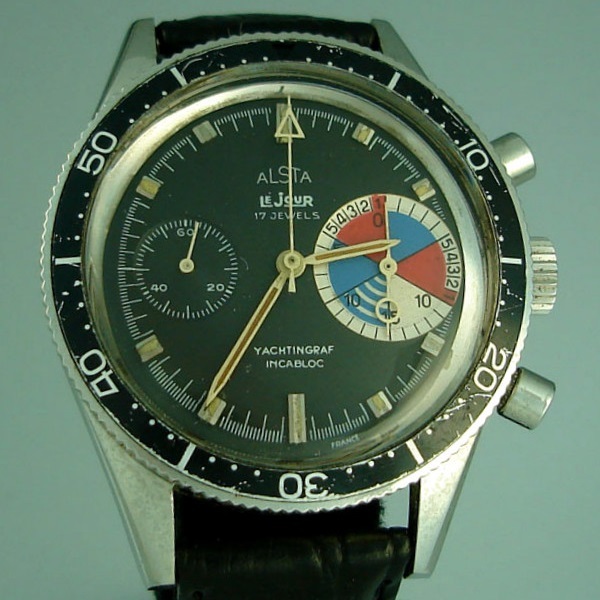 Reference: the first model, rare, two subdials at 3 and 9 o’clock. 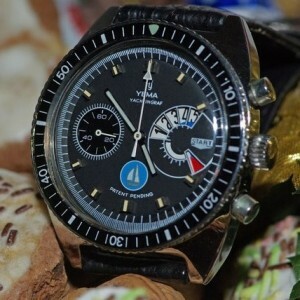 Caliber: manual wound Valjoux 92 movement. 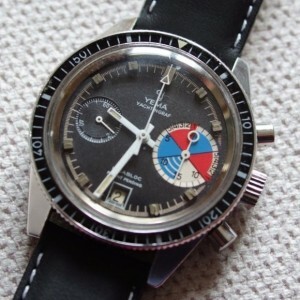 Model: Yema Yachtingraf – type 2. 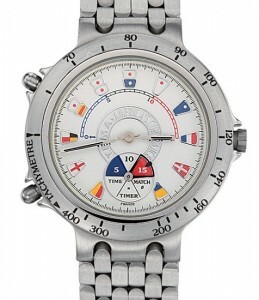 Reference: two subdials at 3 and 9 o’clock. 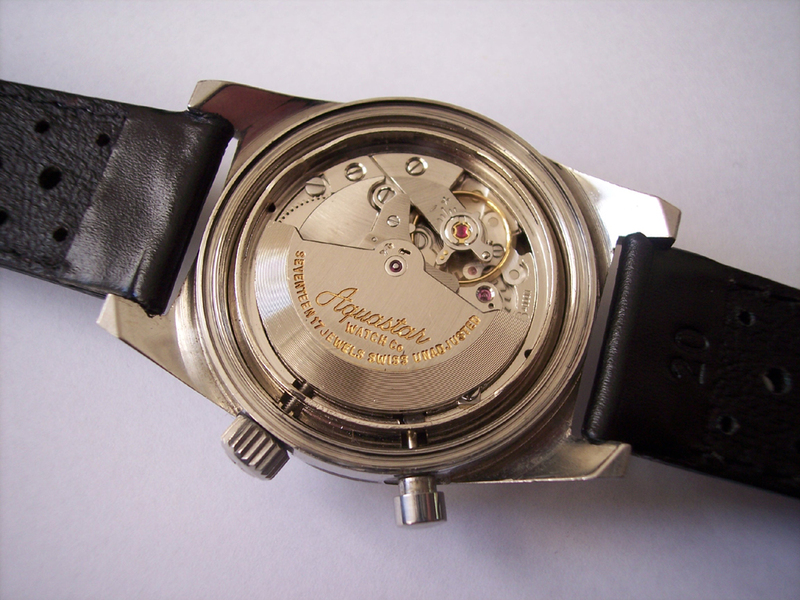 Caliber: manual wound Valjoux 7733 / 7734 movement. 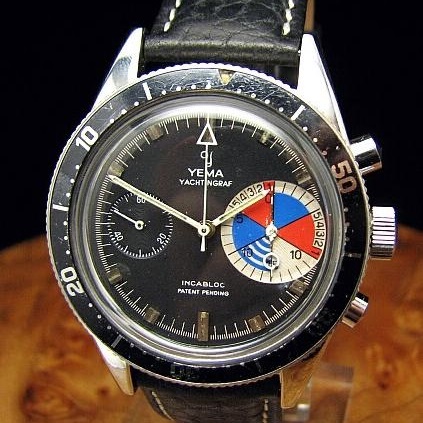 Model: Yema Yachtingraf – type 3. 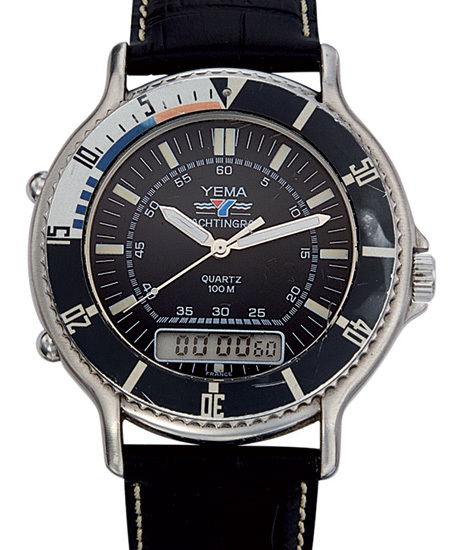 Reference: two subdials, and a date window at 6 o’clock. Caliber: manual wound Valjoux 7734 movement. Type 4 and 5, the Yachtingraf Croisière models, have an extra third subdial at 6 o’clock with a 12 hour register. By means of a red cross over this subdial it counts double, up to 24 hours. 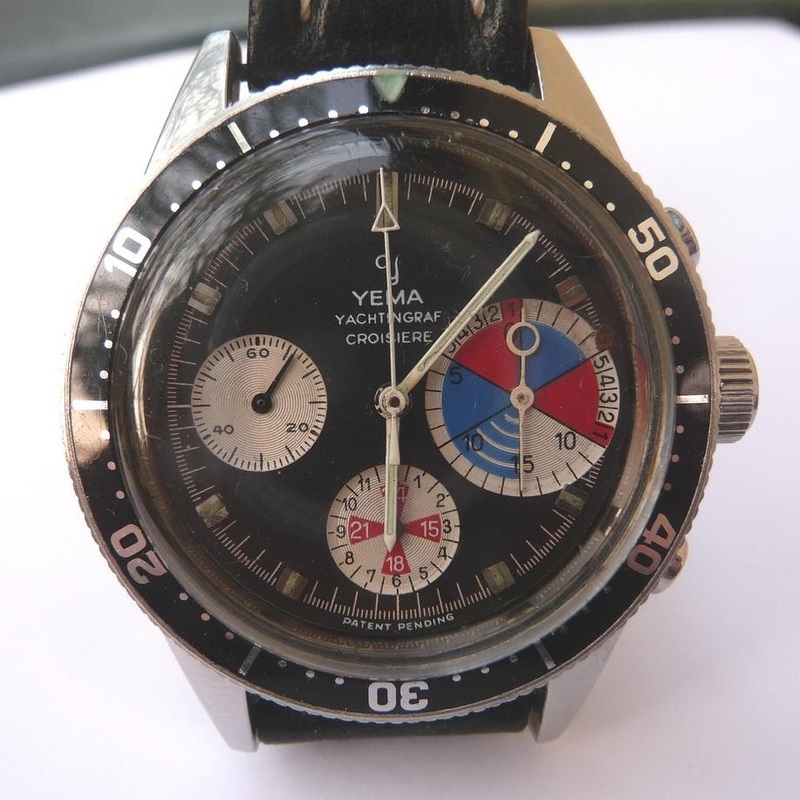 And the Yema Yachtingraf versions 4, 5 and 6. 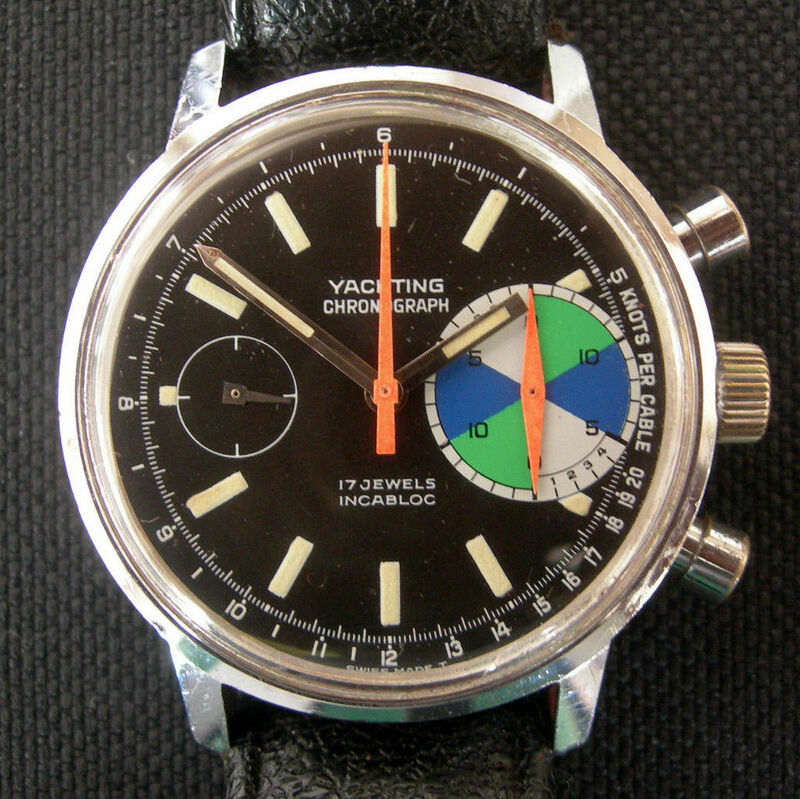 Model: Yema Yachtingraf Croissière – type 4. Caliber: manual wound Valjoux 72 movement. Model: Yema Yachtingraf Croissière – type 5. Reference: 9314. 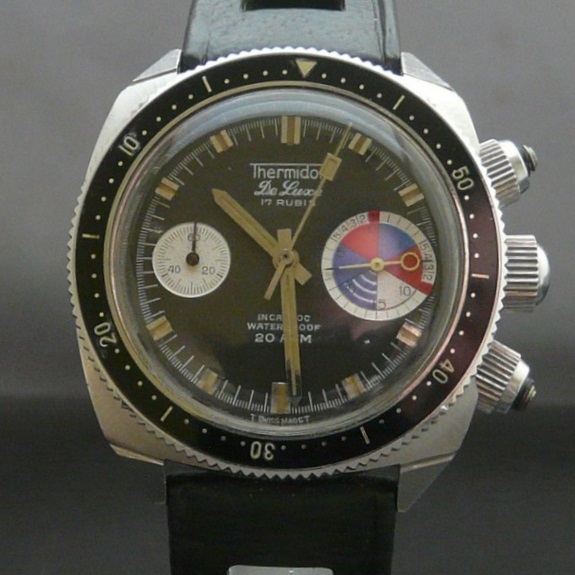 Black subdial at 9 o’clock, third subdial at 6 o’clock. 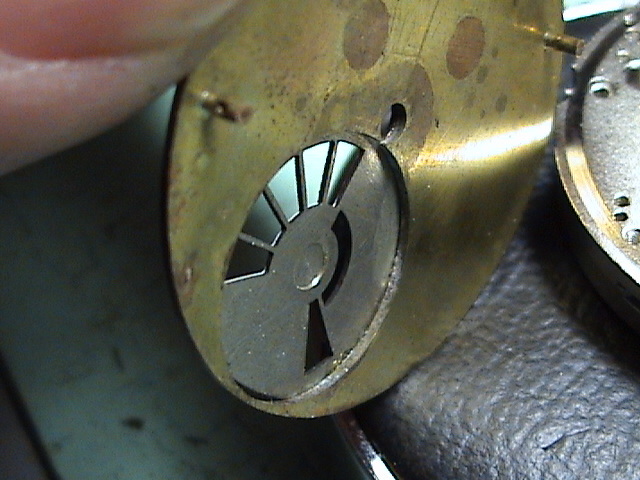 Caliber: manual wound Valjoux 7736 movement. Case size: Ø 38 mm. Model: Yema Yachtingraf Régate – type 6. Reference: with a special indicator disk in stead of a hand. 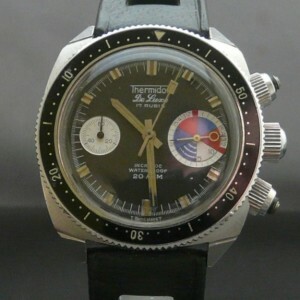 Caliber: manual wound Valjoux 7733S movement. 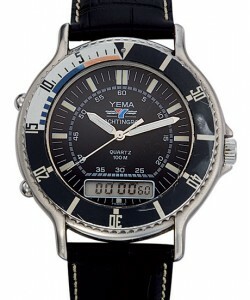 Case size: either normal case Ø 39 mm or jumbo size Ø 44 mm. Definitely type 6 is the most interesting one. 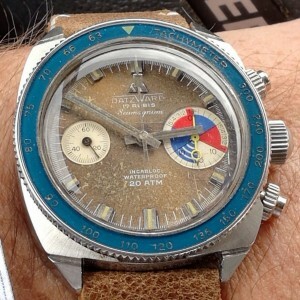 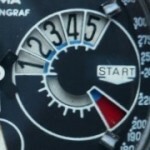 It has a 15 minutes register at 3 o’clock, and a smal indicator disk that rotates under a special cut-out in the dial. The indicator disk moves every 30 seconds, jumping half a minute further to the start of the race. The Yema Yachtingraf Régate has the crown to set the time at 3 o’clock and two pushers for the countdown function. One pusher at 2 o’clock for start/stop, and one pusher at 4 o’clock for reset. 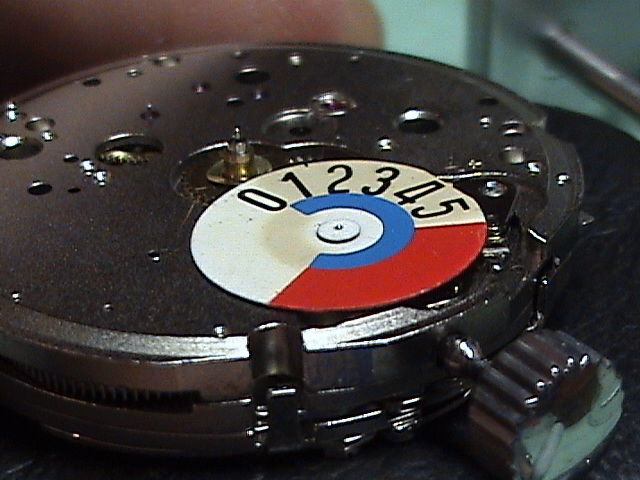 After a reset the countdown subdial shows 1-2-3-4-5 and red in the 6th small window. When the chronograph is activated at the first gunshot the countdown starts and the big white sweep hand is set in motion clockwise. After 30 seconds the indicator disk moves half a minute, and so it does again after 60 seconds, now showing 0-1-2-3-4. A slide bar shows the first minute in blue. 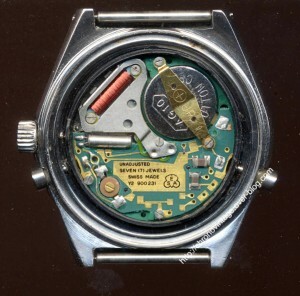 After the first 5 minutes of the countdown, when the second gunshot is fired, the 6th window in the dial takes over the countdown: 5 more minutes to go. Again one minute later, with another 4 more minutes to go, the first window is showing red. 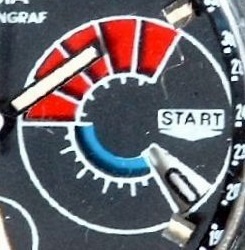 Three minutes later, only 1 more minute to go, and 4 windows showing red. 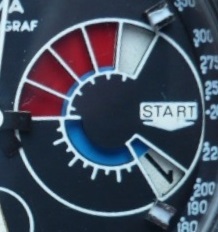 Then, as the final gunshot sounds, all 5 windows are red and the 6th window shows 0. 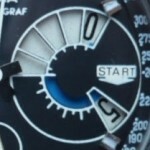 Off you go! 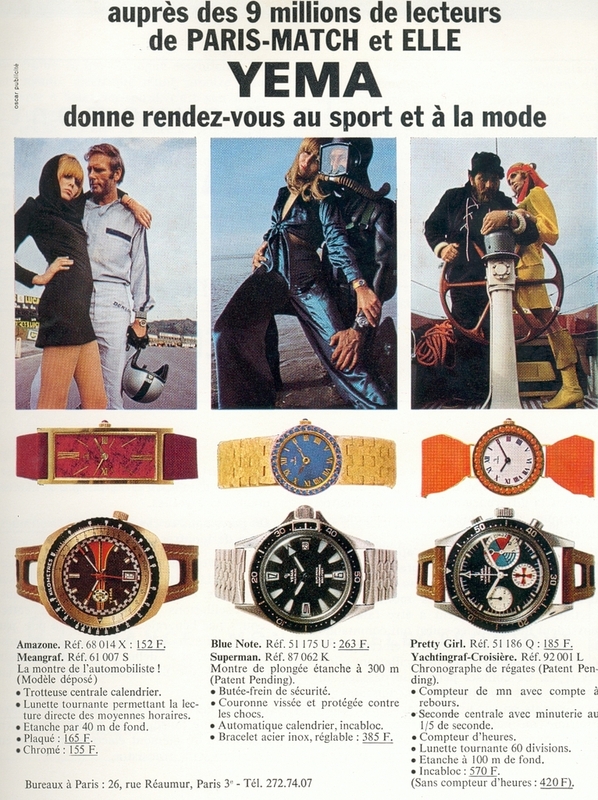 Yema advertisement with the Yachtingraf-Croisière. 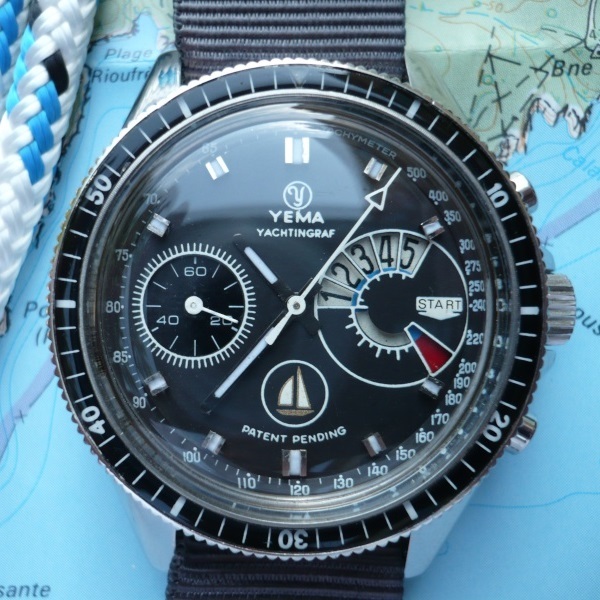 The Yema Yachtingraf Régate was available with two different case sizes, the first one with the black logo at 6 o’clock measuring Ø 39 mm and with a tachymeter along the outer edge of the dial, and a second version with the blue logo at 6 o’clock measuring Ø 44 mm. 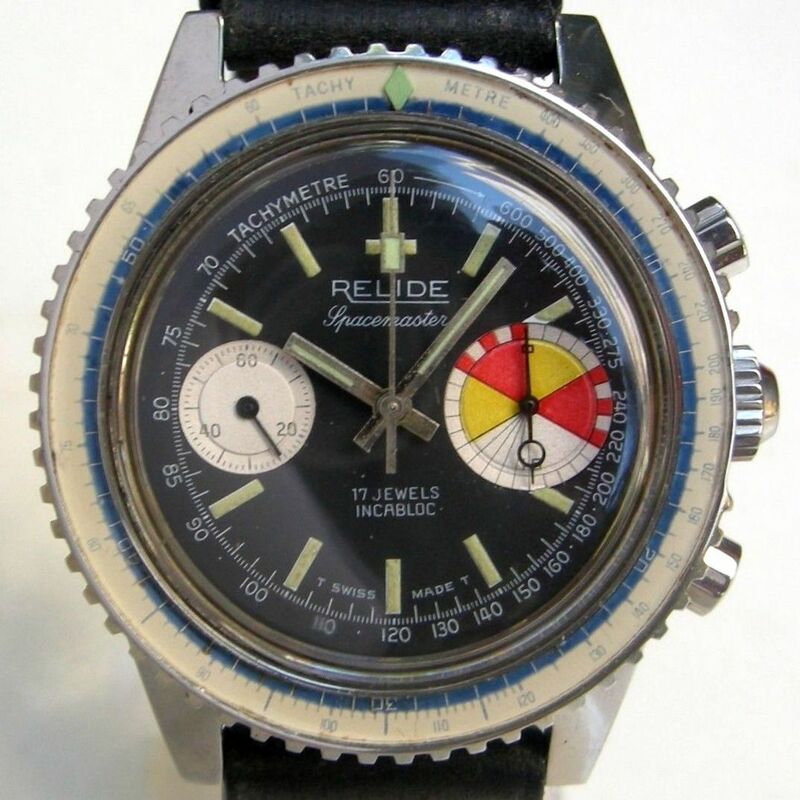 The last one is also referred to as Régate – Jumbo. 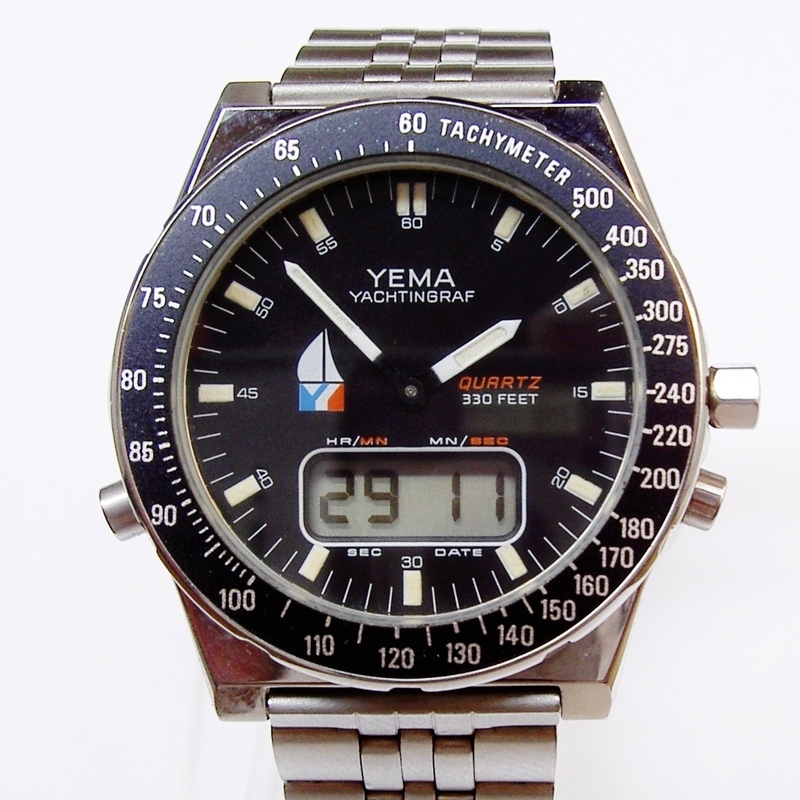 In the mid 1970’s the first quartz movements were introduced, and also Yema decided to invest heavily in the research en development of new models with a quartz movement. 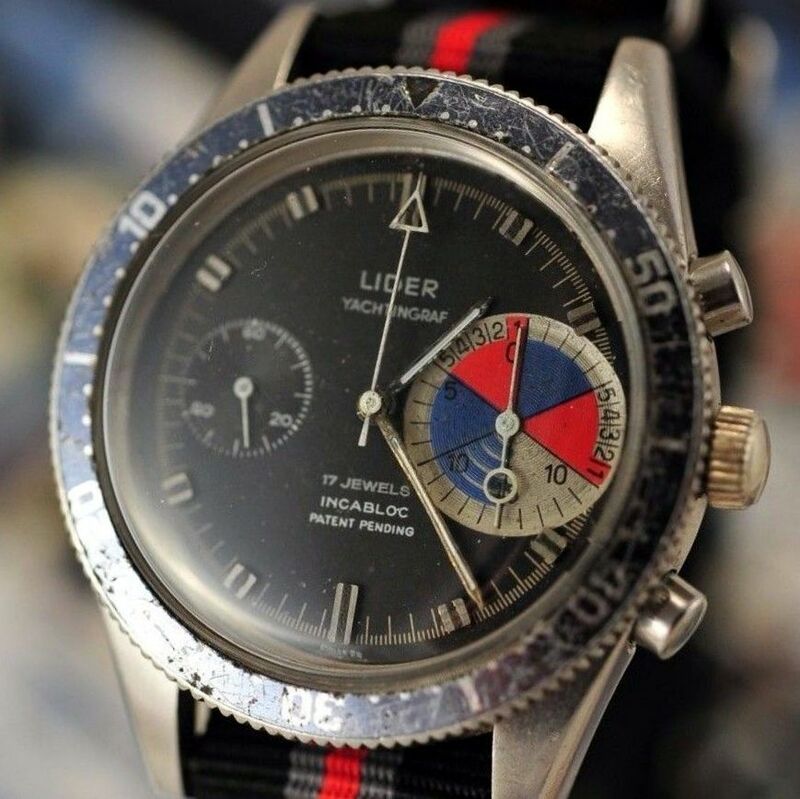 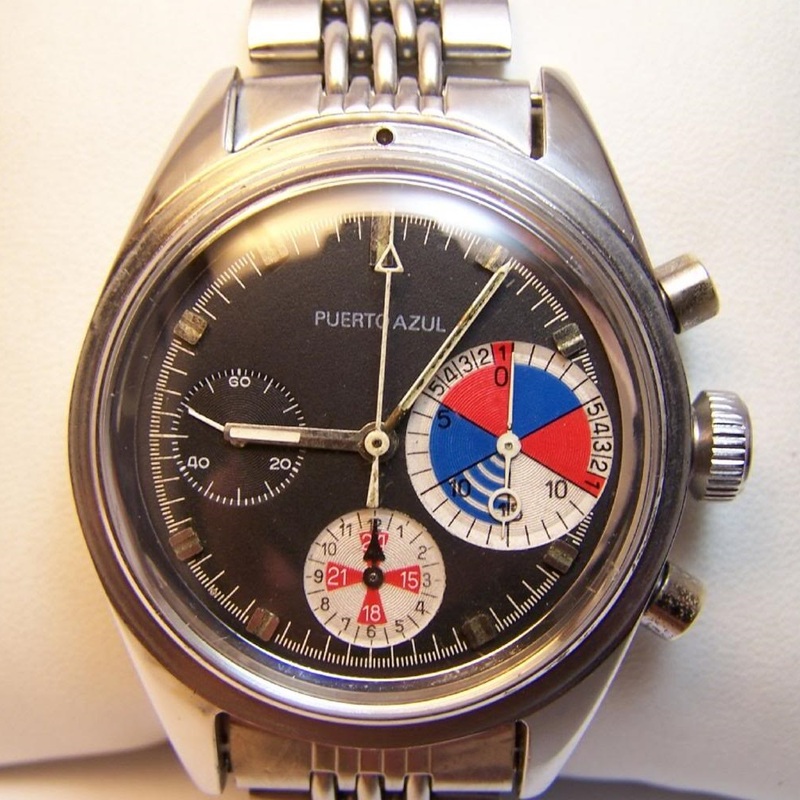 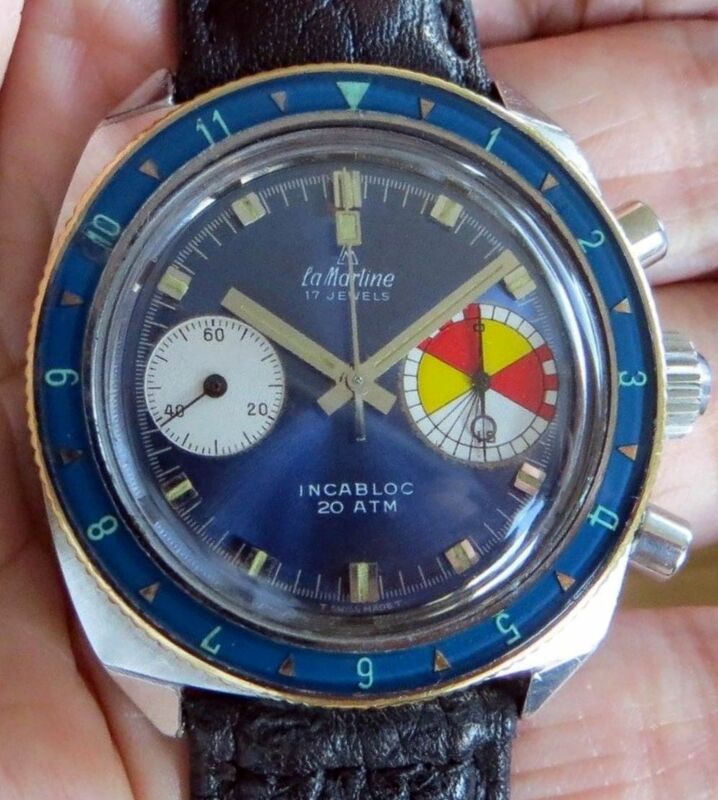 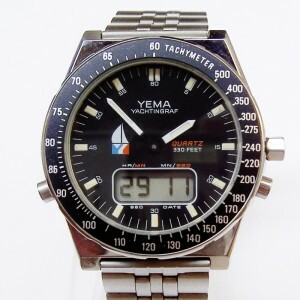 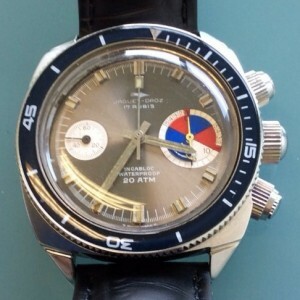 This resulted among others in the second generation of the Yema Yachtingraf in 1977. 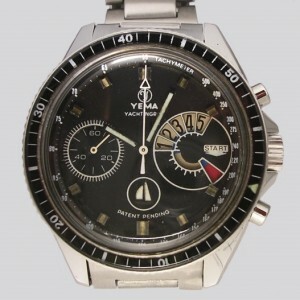 From 1988 until 2004 the Japanese Seiko Watch Corporation is the owner of Yema. 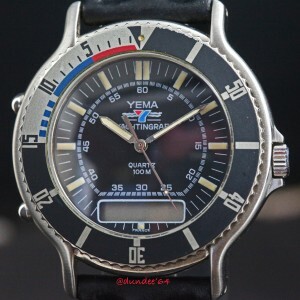 The Yema company is then bought back by French investers and renamed as ‘Yema Horlogère Maison Francaise 1948’. 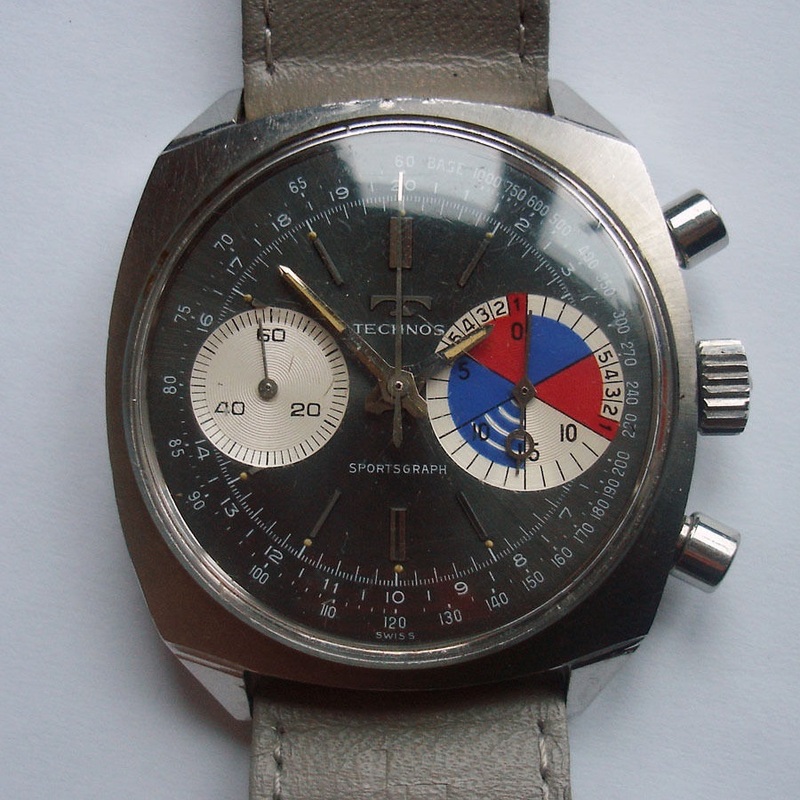 For that reason it is not amazing that a Seiko movement is used in a Yema watch during that period. 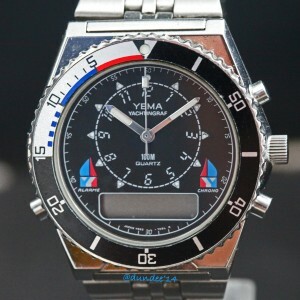 In 1992 Yema is sponsoring the French team as competitor at the America’s Cup, with the launch of the Yema Yachtingraf America’s Cup France with a Seiko quatz movement. 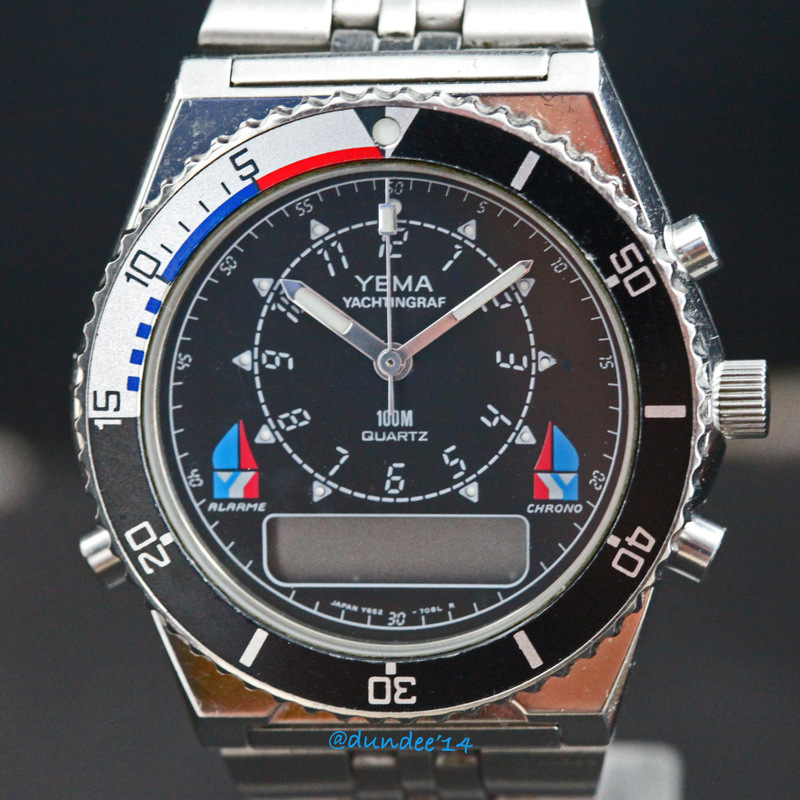 Yema Yachtingraf Quartz and Yema America’s Cup France. From a more recent date are the Yema Yachting models with an ISA 8270 movement, also quartz. 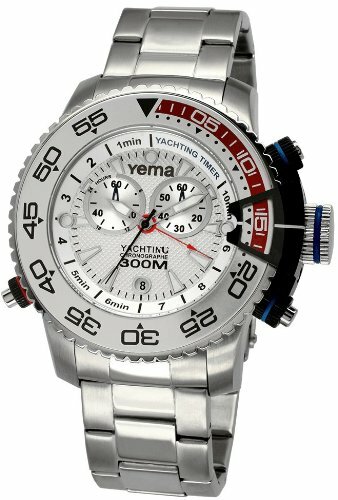 Several models and versions of a Yema Yachting with an ISA 8270 quartz movement. many thanks to Jecko for allowing me to use your picture of the Yema Régate Jumbo. many thanks to Alexander Popov for sending me the pictures of your Jaques-Droz and the rare black-dialed Gallet. 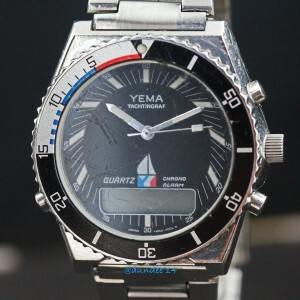 many thanks to Hervé Antoine for sending me the pictures and your input about Yema.